We are going with 2D trees this year. For one we don't own a big artificial tree, two we don't have room for a big tree, three Castle will just topple/eat the tree, four we've never had a 2D tree so it would be interesting to give it a try. 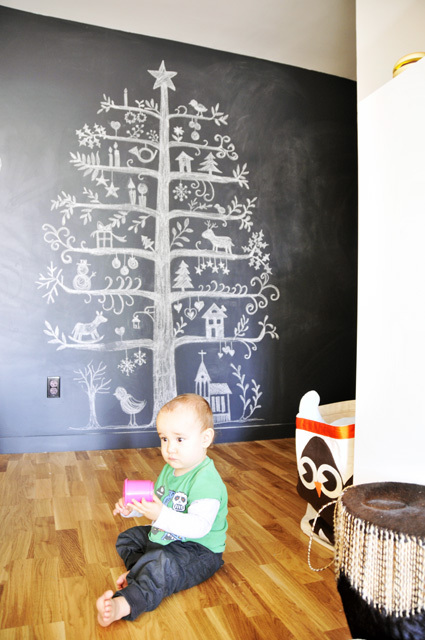 And where better to put a 2D tree than on our chalkboard wall! It's a wall hanging painted on fabric from here. See, total copy, didn't even try to be different because I love it so much just the way it is. Castle loves to touch it so it's been smeared a few times already, which is okay because I draw something different back on each time, so it's kind of a dynamic ever changing Christmas tree. Only at the bottom though. 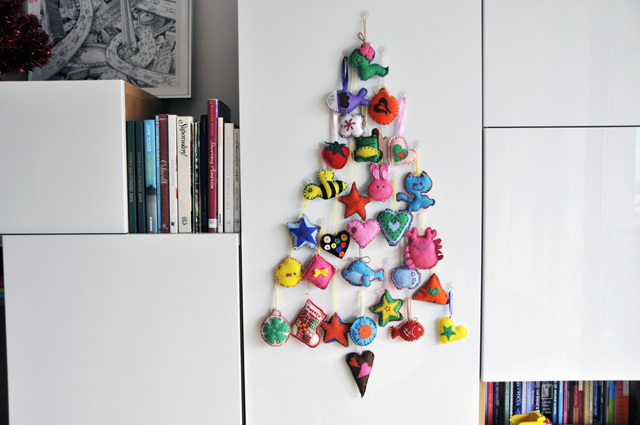 There's also a couple of 2D trees on our wall unit as well. The glossy doors turned out to be a great upgrade decision, because I can use little suction cups on it to hang things. 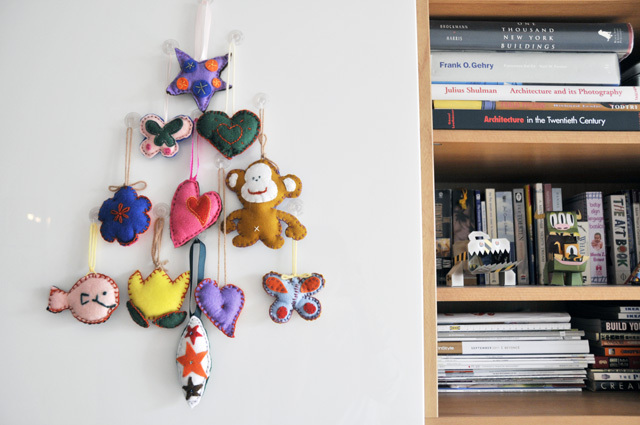 For instance, Christmas ornaments. 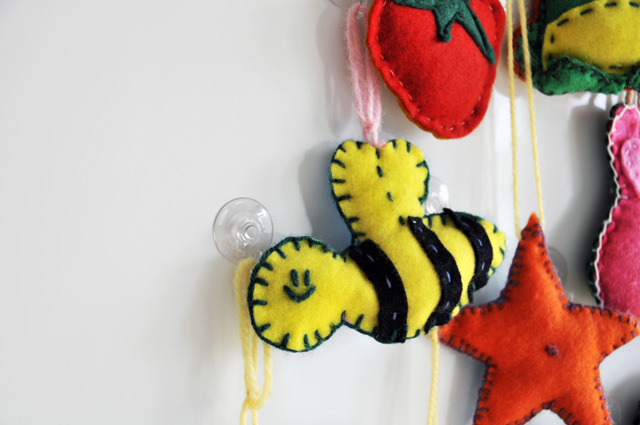 I made these felt ornaments when I was a teenager. Here's the other little one. I'm pretty happy with the decorating progress so far. No lights yet, maybe next week. Oh my word - that is truly gorgeous!!! 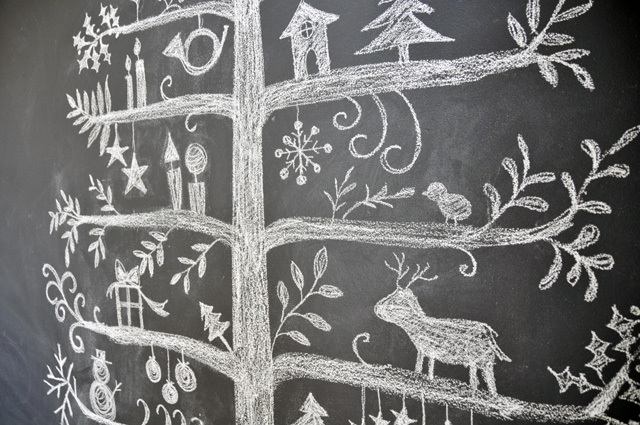 Oh I LOOOVE your chalkboard tree!!! I am trying to turn my teenage son's room into a guest room for Christmas weekend and I am definitely doing this on his chalkboard wall - how lovely! Thanks for sharing and Merry Christmas! Kimara, go paint that wall! We do not regret it one bit. Other colours are great too, but the white chalk may not stand out as much. And thanks for the link! Cheers. I hope you like it as much as we do! Thanks for sharing your example. Rhonda, I'm so glad you get to enjoy this tree in your home too! Looks awesome! I fell in love with your tree the moment I saw it. 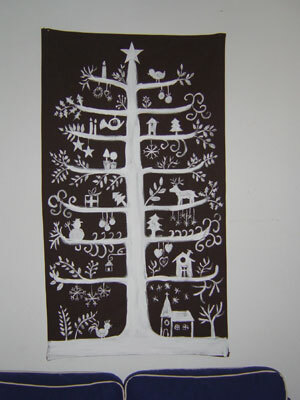 I don't have a chalkboard wall (renting a house right now), but I did have scratch boards in my craft drawers, so I used those instead and I love how it turned out (http://madebymarquette.blogspot.com/2012/11/scandinavian-christmas-tree-scratchboard.html). Thank you for sharing your lovely talents with us! This is just beautiful!! 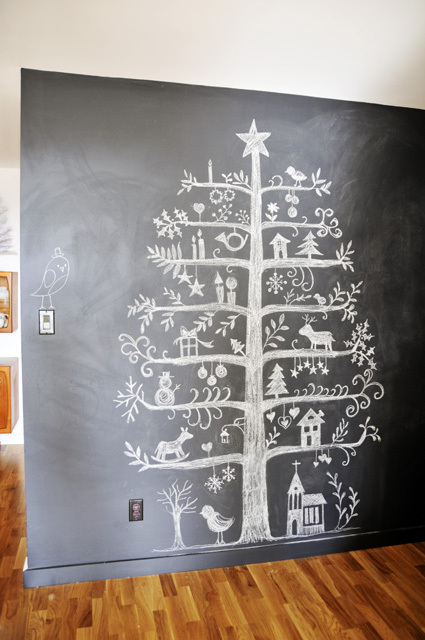 I love this idea so much, I might have to paint a wall in the house with chalkboard paint just so I can do it! This is fun! I may have to try this. Have you added lights? Love the idea. Thanks!